Terror victim association Almagor responded to this morning’s brutal massacre at a synagogue in Jerusalem’s Har Nof neighborhood. “You cannot continue to wage a low-intensity battle in the face of a third intifada which is patterned after the Islamic State beheadings and stabbings. Israeli citizens are now paying the price for the containment and restraint policies opposite violent demonstrations that keep escalating into bigger and more extreme terror attacks,” they said. Lt. Col. Indor, Director of Almagor terror victims group, asks hard questions exposing government’s numerous security failures. Lt. Col. (ret.) Meir Indor, Director of the Almagor terror victims organization, raised numerous security failures in a sharp letter to the Israeli Security Cabinet on Tuesday. “Pursuant to the recent series of automotive terrorist attacks, the Judea and Samaria (West Bank) regional command ordered the placement of barriers at transit hubs, especially those in the Gush Etzion area. Why were they never set up?” asks Indor. Noting the limitation of Arab travel through Judea and Samaria imposed via roadblocks during the 2000 terror war or “Second Intifada,” Indor asked why the government has not taken similar steps in light of the recently escalating security situation since June. Indor also called for a reconsideration of the management of internal security when faced with rampant terrorism, suggesting that “field commanders” be assigned to lead the efforts instead of the Israel Police, whose experience is in fighting the criminal world. Combating the notion of “lone terrorists,” Indor noted such attacks are the product of organized incitement, which lead to demonstrations and result in “lone terrorists.” He called to put an end to the violent demonstrations and riots so as to prevent further escalation. “Why is the unit of the Ministry of Justice responsible for acting against incitement not fighting for the arrest of those publishing the anti-Jewish incitement now pervasive online? Why is the cyber crime unit of the Israel Police not acting against this incitement?” asks Indor. “Had the two aforementioned agencies acted promptly and decisively, two terrorists who published incitement would have been arrested before they had the chance to commit yesterday’s attacks,” he added in a reference to the Tel Aviv and Gush Etzion attacks. Regarding breaches of security fences, by which the terrorist who committed the attack in Tel Aviv was able to illegally enter Israel, Indor asks why regulations are not being enforced at the fence, and why forces are not given orders to shoot those infiltrating illegally. “The government must rectify these two failings by enacting measures to truly worsen imprisoned terrorists’ living conditions and by destroying terrorists’ families homes and expelling them to Jordan, Lebanon, or Gaza,” demanded Indor. Jailed terrorist Marwan Barghouti, serving five life sentences in Israeli prison, receives seven-day stint in solitary confinement in wake of letter he sent to Palestinian leaders in which he called for a resumption of armed struggle against Israel. Jailed Palestinian terrorist Marwan Barghouti, the former leader of Fatah’s Tanzim military wing who is serving five life sentences in Israeli prison for involvement in terrorist attacks during the Second Intifada, has been sent to a seven-day stint in solitary confinement after calling on Palestinians to resume armed struggle against Israel. Barghouti also received a fine. Barghouti also called on Palestinians to “immediately halt security cooperation with Israel and stop the coordination between the occupation security forces and the Palestinian security forces.” Barghouti is considered to be a candidate to succeed Abbas as chairman of the Palestinian Authority. Following the letter, the Almagor Terror Victims Association called for Barghouti to be stripped of some of the rights granted to Palestinian prisoners. Almagor organization calls for measures against arch-terrorist who advocated “armed resistance” from his jail cell. “As an immediate measure, he should be isolated from any contact with outside visits and any contact with other prisoners, so that he is blocked from issuing inciting letters from prison,” the organization said. 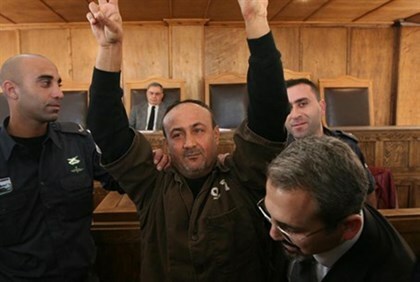 Barghouti, who is widely believed to have masterminded the second intifada, which exploded across Israel from 2000 to 2005, wrote the letter from his cell in Israel’s Hadarim prison. Jerusalem is our capital and there will be no concessions, says Palestinian Authority President Mahmoud Abbas on 10th anniversary of Yasser Arafat’s death • Jailed Palestinian terrorist Marwan Barghouti calls for renewal of armed struggle. The Palestinian Authority marked the 10th anniversary of the death of Yasser Arafat on Tuesday, with thousands of Palestinians attending a rally in Ramallah at which PA President Mahmoud Abbas delivered an inflammatory speech in line with Arafat’s legacy. Abbas accused Israel of leading the region toward a “religious war” and claimed Israel was responsible for the escalation of violence at the Temple Mount and in east Jerusalem. “Leaders of Israel are mistaken if they think they think they can rewrite history, establish facts on the ground and divide the Al-Aqsa mosque in terms of prayer times and prayer sites, as they did at the Cave of the Patriarchs [in Hebron],” Abbas said, to applause from the crowd. Abbas’ words drew a sharp response from Prime Minister Benjamin Netanyahu, who said Abbas was making matters worse. In his speech, Abbas also attacked Hamas, accusing the terrorist group of undermining Palestinian reconciliation efforts after a seven-year rift. Fatah and Hamas agreed in June on the formation of a unity government, but Hamas, which violently seized Gaza in 2007, continues to control the coastal enclave. Abbas accused Hamas of carrying out a series of bombings on the homes of Fatah leaders last week that led to the cancellation of what would have been the first Arafat memorial ceremony in Gaza since 2007. He also said the group was blocking post-Operation Protective Edge reconstruction efforts. Meanwhile, jailed Palestinian terrorist Marwan Barghouti, the former leader of Fatah’s Tanzim military wing who is serving five life sentences in Israeli prison for involvement in terrorist attacks during the Second Intifada, called on Tuesday for Palestinians to resume armed struggle against Israel. Barghouti also called on Palestinians to “immediately halt security cooperation with Israel and stop the coordination between the occupation security forces and the Palestinian security forces.” Barghouti is considered to be a candidate to succeed Abbas as chairman of the PA. The initiative comes a week after Mu’taz Hijazi, a terrorist released from Israeli prison, attempted to assassinate Temple Mount activist Rabbi Yehuda Glick. Almagor Terror Victims Association is preparing a database of released terrorists so businesses can look up potential employees, accusing the Justice Ministry and Israel Police of negligence for not doing so themselves. The initiative comes a week after Moataz Hejazi, a terrorist released from Israeli prison, attempted to assassinate Temple Mount activist Yehudah Glick outside the Menachem Begin Heritage Center. Hejazi worked in Terasa, the restaurant in the museum, where Prime Minister Benjamin Netanyahu, President Reuven Rivlin and other senior officials have dined. Terasa’s management said after the attack that they did not know Hejazi had been in Israeli prison for multiple stabbings and murder attempts. 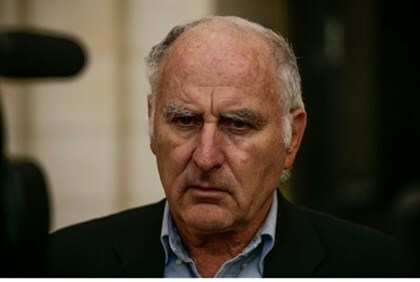 “We checked, and the police and Justice Ministry do not have any system of warning workplaces,” Almagor director Meir Indor explained, demanding that they establish one to limit terrorists’ easy access to Israelis. Families of terror victims have already begun voluntarily providing the organization with details about the terrorists and whom they killed or injured, and requested that the ministry provide them with information about the terrorists’ locations. Indor pointed out that the justice minister does give information about pedophiles freed from jail. As to whether prisoners should be rehabilitated in prison and have the chance to start a normal life when released, Indor said the academic theories on the matter do not apply to terrorists. Indor accused the government of not “connecting the dots” after Wednesday’s two vehicular terrorist attacks, saying they were avoidable and raise serious questions. The Almagor chairman pointed out that Ibrahim al-Aqari, who perpetrated the first attack, was the brother of a terrorist released in exchange for then-captive soldier Gilad Schalit. “This one saw his brother the murderer become a local hero and released from prison, and then followed in his brother’s footsteps,” he said. “How is it that [the government] failed to arrest the terrorist who committed the murder despite his publication of incitement and praise of murderers?” Indor called for the immediate arrest of the dozens of persons known to the Shin Bet (Israel Security Agency) who live in east Jerusalem and incite violence and organize the “ongoing intifada” in the capital. “The current of violence is an organized campaign orchestrated by the Palestinian Authority and its president, precisely as stated by Israel’s prime minister—but the prime minister is not a commentator. His government’s job is not to make declarations but to take action!” he said. The Justice Ministry did not respond to requests for comment.